Let Wolbers/Possehn put you in a Nordic Hot Tub. Shop local with a West Michigan business and let our spa experts fulfill all your relaxing dreams. 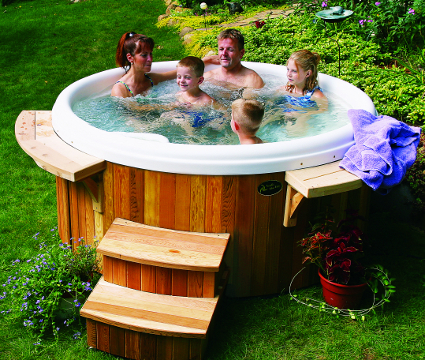 Nordic Hot Tubs are 100% made in the USA and produced in Grand Rapids, Michigan. They are designed for cold water use and come in 26 different models! provides the perfect place to gather friends and family for fun and relaxation. Give loved ones the gift of tranquility, melting tensions with Nordic's exclusive dual-therapy system ( ), offering not only traditional jets, but also gentler, whole-body whirlpool therapy. Most spas offer only a single type of hydrotherapy jets that target specific body zones. Nordic's creations offer targeted therapy with unique configurations of powerful jets, but also offer whole-body whirlpool therapy to more gently massage not only the back of the body, but also the front. Because of Nordic's high-flow turbo jets and barrier-free seating, your body can be surrounded by swirling water that soothes muscles and joints. Lush elegance. Effervescent leisure. The Nordic Rendezvous LS. The innovations on display in Nordic's Crown II, rivaled only by its lavish style, will impress the most discerning of spa users. Up to five bathers of any age can enjoy the deep, unobstructed seating and let tensions and worries stream away through swirling warmth and massage. offers a romantic getaway and incredible hot water therapy. With seating for two, this spa can help you spend alone time with a loved one or simply offer sanctuary from every day stress to couples or individuals. Powerful jets to include hip, wrist, and elbow jets, provide invigorating hydrotherapy to tense areas of the body. Plus, Nordic's exclusive dual-therapy system ( ) offers gentler, whole-body therapy to complement these traditional, more targeted jets. offers unprecedented value. With seating for five, this spa can help you create quality family time or simply offer sanctuary from every day stress to couples or individuals. Powerful jets provide invigorating hydrotherapy to tense areas of the body. Plus, Nordic's exclusive dual-therapy system( ) offers gentler, whole-body therapy to complement these traditional, more targeted jets. The versatile bench seat can be used as full body massage from the Whirlpool Jet. Unlike other spas that offer only targeted hydrotherapy, this gentler therapy has proven better at peeling away tensions and stress from the entire body by releasing lactic acid from all body zones and allowing oxygen to flood every tissue and fiber. Click Here to see more Nordic Models & Specifications.